Kirkwood Gardens offers you a location convenient to downtown, restaurants and shops while maintaining a small neighborhood feel. Kirkwood Gardens is a certified EarthCraft property, making it environmentally friendly and saving tenants up to 50% on their energy bills. Call 404-378-6563 for leasing information. 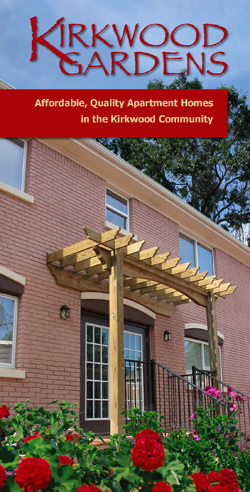 Kirkwood Gardens is located in East Atlanta at 1929 Hosea Williams Drive, SE, Atlanta, GA 30317. I-20 east, exit at Maynard Terrace, turn left off exit, turn right onto Memorial Drive, go 0.3 miles and turn left onto Warren Street. Go 0.4 miles to Hosea Williams Drive. Kirkwood Gardens is 0.1 miles on the right. 580 sq. ft., Rent starting from $520/mo. 743 sq. ft., Rent starting from $625/mo.